Products – Cameras – CM-818DVR4V – Team Research Inc.
Security DVRs enable you to monitor and record multiple cameras at the same time. 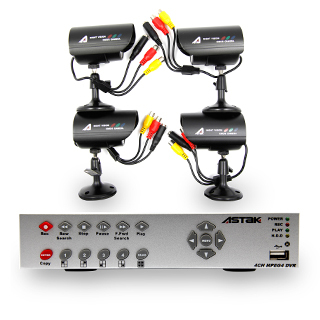 This bundle package combines a DVR with 4 weatherproof wired cameras for a complete security solution! • 4-Channel MPEG4 DVR system with 250GB hard drive and 4 weatherproof night vision color camerasWith VGA out (connect to monitor) and Video out (connect to TV). • Ideal for your business, office and home/do-it-yourself protection, safety and security kit. • With internet monitoring function Manual/Alarm/ Schedule recording mode and recording speed option built-in USB port for data backup. • User friendly interface efficient search by time and event list motion detection function. • System includes 4 weatherproof night vision security color cameras (with 12 IR LEDs, night vision range: 25 feet).